Your personal eyewitness on the road. The Navman MiVue 338 is a HD digital video camera, with still image, date and time stamp and event recording. Safeguard your car and yourself from fraudulent claims by recording and saving a protected video file that can be analysed after a car accident. 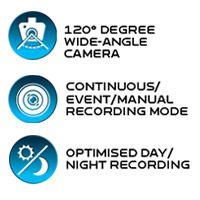 You can choose to record either continuously, manually, or use the event recording mode, which records when the 3-axis G-shock sensor detects an event of sudden change in motion, and instantly saves a protected file. This 120 degree wide-angle HD digital video camera captures high quality video at any time of day or night - for capturing every detail on the road. Record your driving direction with a 3-axis G-Sensor, to show the direction the impact came from and record how the impact happened, making this the car black box you can't live without. 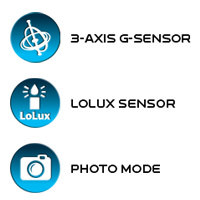 The LoLux sensor provides enhanced low-light sensitivity, which helps capture a wide range of details even in dark conditions. If you need to collect on-scene photo evidence, you can use the MiVue338's high-quality Digital Photo Mode to capture dents or scratches. With still image, date and time stamp and event recording. 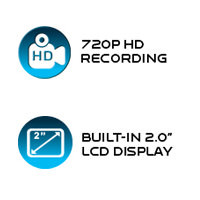 The MiVue 338 digital video recorder captures high definition videos at 720p HD resolution, on H.264 video format. For post-accident analysis, you can use AV output to view videos on a HDTV or the provided desktop software will analyse your driving directions, browse recorded videos and easily store and share your video evidence.